There is something about Thailand that keeps bringing tourists back year after year; the exotic area with crystal blue waters and excitement at every corner will easily take your breath away. I was lucky enough to travel to Thailand once again this year. This was my third visit; three times a charm right? Like always I wasn’t disappointed. Having visited Phuket a few times it was nice to travel to Thailand with the intention of having a proper relaxing holiday. Often we will get swept up in the tourist attractions and come home just as tired as we left! I made sure that definitely wasn’t the case this trip, after all a holiday should be a chance to unwind and relax. Phi Phi Islands: You know you have hit the jackpot when you can take an image that looks like a postcard (like above). These islands are so perfect its often hard to believe they exist. With waters clear, blue and luke warm complimented by fine white beaches Phi Phi Islands are the ultimate tour for people wanting to take in some beauty while getting to relax. Bangla Road: Now we all know that Bangla Road is party central, but I love this street so much more than just the bars and clubs. Bangla road is perfect for people who like to people watch, spending an afternoon with a drink and watching the world walk past can be surprisingly unwinding in the middle of the busy strip. Flying Hanuman Tours: Now this isn’t for the feint hearted! You definitely get a new perspective when zipping through the tree tops on this tour. The mix of adeline and amazement of the views makes this activity definitely one to put on your list if your up for a bit of excitement. Until next time when I plan to visit again! 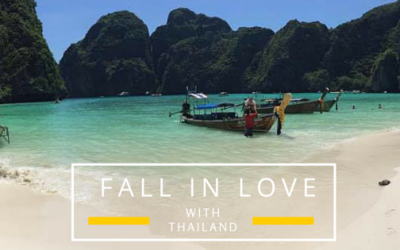 Has my holiday got you thinking of Thailand for your next adventure? Contact Josh now on 1300 761 901 to book!